When importing a single listing with WP-Lister for Amazon, you may see two rows created on the Listings page if the ASIN is a child variation of a parent variation. This is because when you import a child variation, WP-Lister will import the parent variation as well. WooCommerce works the same way to store variations in the database: There is a parent product (post ID) which has multiple child variations (with different post IDs). This is not recommended to use unless you never plan to add new Amazon listings from WooCommerce. 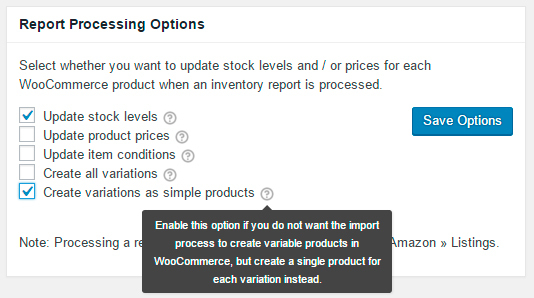 If there are no variable products in WooCommerce, the only way to list variations on Amazon would be to match a WooCommerce product to an existing ASIN. If the product only has a single variation, importing the child variation as a simple product does make sense. But for other products where you sell more than just a single variation (color, size, etc. ), you would want them to appear in WooCommerce the same as they do on Amazon: with a drop down menu to select the color and/or size. WP-Lister will also import the default image for each variation during the import process. Every variation has its own image(s), but unfortunately WooCommerce can only store a single image per variation so WP-Lister can't import multiple images for a single child variation.